Would you like to be able to take better care of your gums and teeth? 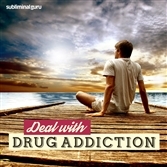 Want a quick and easy way to achieve it? As an adult you only get one set of teeth, so it makes sense to treat them well. 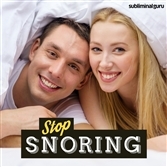 Neglecting them can cause bleeding, swelling, and bad breath, leading to gum disease and tooth loss in the long term. 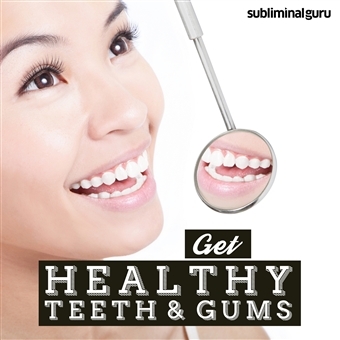 With the Get Healthy Teeth & Gums subliminal session, you'll find the motivation to care for your teeth and gums automatically! As you listen, thousands of potent positive affirmations will change your thinking, helping you become more determined and proactive. You'll adopt a more comprehensive routine, brushing and flossing on a regular basis. You'll rinse with mouthwash to destroy any lingering germs, keeping your mouth healthy, fresh, and disease-free. Keep your teeth and gums in shape! 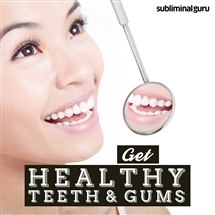 Download the Get Healthy Teeth & Gums subliminal audio now to enjoy strong and healthy teeth and gums for many years to come. I take excellent care of my teeth. I floss regularly to clean between my teeth. I rinse with mouthwash to strengthen my gums. My teeth and gums are strong and healthy. I visit the dentist at regular intervals. People admire my beautiful teeth. My oral hygiene routine is highly effective. I love the feeling of a clean and fresh mouth. I rinse my mouth after every meal. I avoid foods that can damage my teeth. It's easy for me to enjoy healthy teeth and gums.